Here's a versatile 3 element 2 meter beam that's just the ticket for hunting on foot. It's lightweight, easy to carry and has flexible elements that will bend and then come right back into position, a handy thing to have when you're hunting in an area with trees and brush. Not only that, but the elements can be folded or rolled up, so it stows easily in that small storage area in your car. 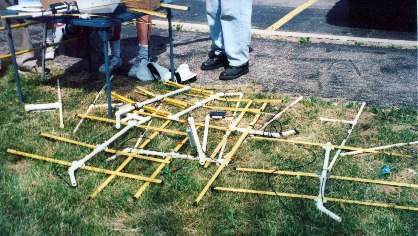 The elements are made from a steel tape measure, and the boom is from 1/2" PVC pipe. You can probably build the entire thing for less than $10 if you keep an eye out for a cheap tape measure. 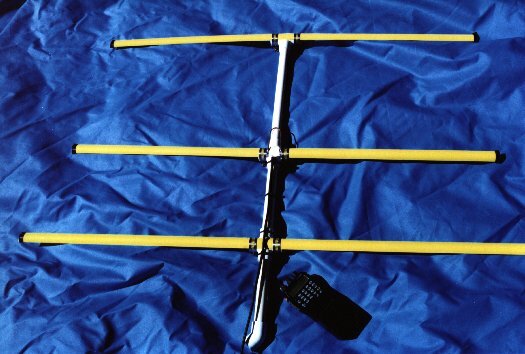 This antenna, used with an external attenuator, is all you need to track down those small portable hidden transmitters in the on-foot portion of many Foxhunts. Many hunters also use it on mobile hunts, where its flexibility makes it easy to get in and out of a car when you want to stop and take a signal bearing. I built the one you see here using a 1-inch wide tape measure for the elements. You can probably also make the elements from a 3/4" wide tape. 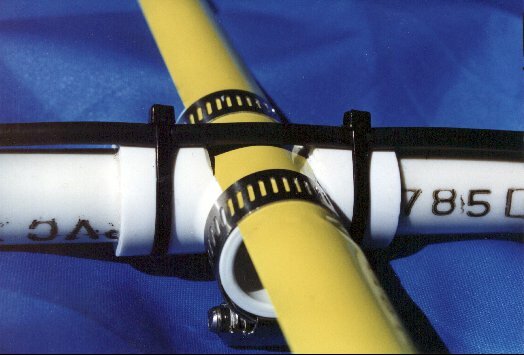 The ubiquitous 1/2" wide tape would be a little too narrow and too flexible to keep 2 meter elements straight as you walk along, but I've heard that some Hungarian foxhunters in serious international competitions have used DOUBLE and TRIPLE THICKNESSES of 1/2" tape for the centermost portions of their elements, with good success. This gives them a good combination of rigidity and flexibility as they run (yes, run) the course looking for the hidden transmitters. 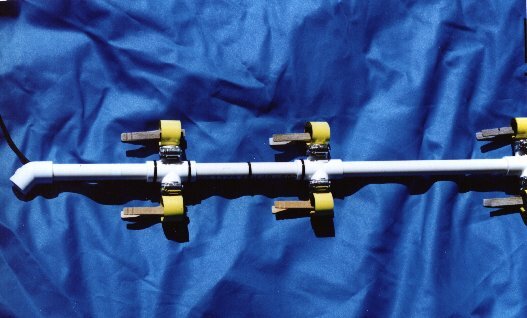 At the 1999 Dayton Hamvention Foxhunt, organizers had more than ten of these beams for visiting hunters to borrow. I used my beam with its 1" wide elements for this hunt, which was held mostly in a very large (and windy) open field. My antenna worked exceptionally well, as it has for me in the past, but the wind played a trick or two with even my 1" wide elements. I'll probably back up the center portions of my elements with another (shorter) section of 1" wide tape to strengthen each element just a little more. SAFETY NOTE: Be careful of the sharp ends of the steel tape as you cut the elements. They can inflict a nasty cut. Be sure to put some plastic electrical tape or other protection over the cut ends of the elements before you do anything else. Now here's a look at the one I built. Click on any photo for a larger version. You can compare the size of the yagi to the HT. Here's the feedpoint, with direct attachment of the coax and the "Hairpin" match. See Joe Leggio's original construction article for dimensions. 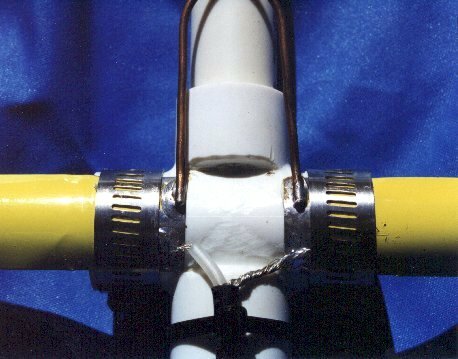 The PVC "Tee" is filed away to allow the element to lie across the fitting without undue bending. Take special note of the special non-conductive antique clamps that W2KI uses to keep the elements rolled up for travel. Here's a (partial) glimpse of the antenna in "storage mode". 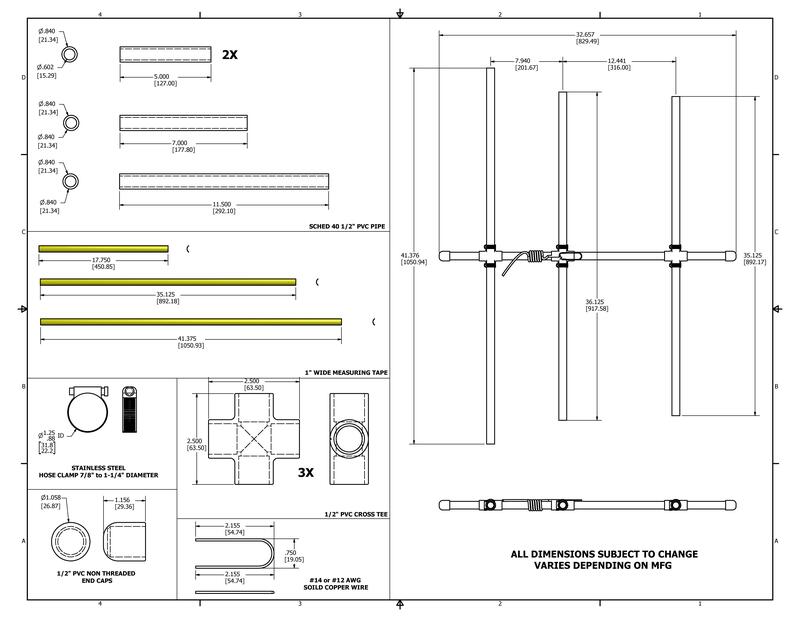 Another Schematic for building a tape measure beam.